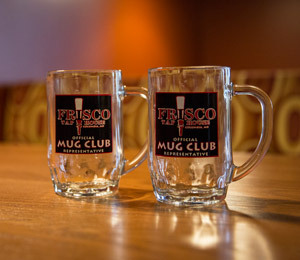 Become a member of the Frisco Taphouse Mug Club today! There are two levels of achievement in the Frisco Taphouse Mug Club. The first is to drink and track 50 different beers and you will earn a Mug Club T-shirt. The next level of the Mug Club is accomplished by drinking and tracking 100 unique beers that are signed off by a Frisco Taphouse Bartender. Your Mug Club activity is now being tracked by a Mug Cub Book that you can pick-up from your Bartender at either location. When you are ready to pay your tab, simply hand your book to the Bartender who will authorize and sign off on your Beers consumed. For more details on our Mug Club…see your Bartender today!